Auction ends: December 11, 2016 9:40 AM PST. Comments: A Ñanduti rectangular shawl. Interesting Sol motifs some of which which appear to be arranged in rows along the length of the piece. Smaller pieces of this quality usually have the palm leaf motif along the edge. But I’ve seen several rectangular shawls which do not, as in this piece. Piña fiber was used pretty exclusively in the Philippines, not Paraguay, and the Ñanduti pieces from South America are cotton. The sol motifs in this piece are a little more open than typical, but I’m reasonably sure it’s a Paraguayan product. Soilage: Seller says it has been carefully laundered but gives not details on the process. Now ‘snowy white’. Auction ends: December 11, 2016 10:32 AM PST. 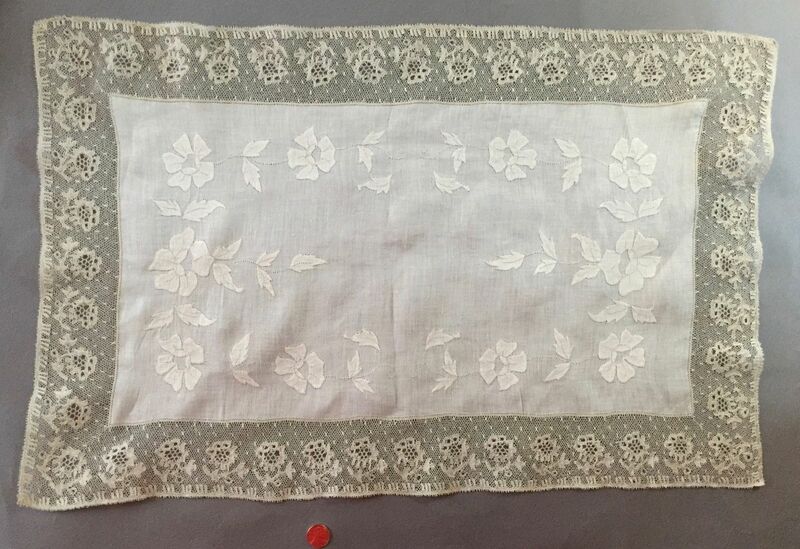 Comments: A high-end market handkerchief of Brussels bobbinlace applique on machine net. Good technique in the floral design, and note the ring esprits scattered through the ground (probably needle made). No elaborate ‘mode’ fillings, just a few knots and rings in flower centers. 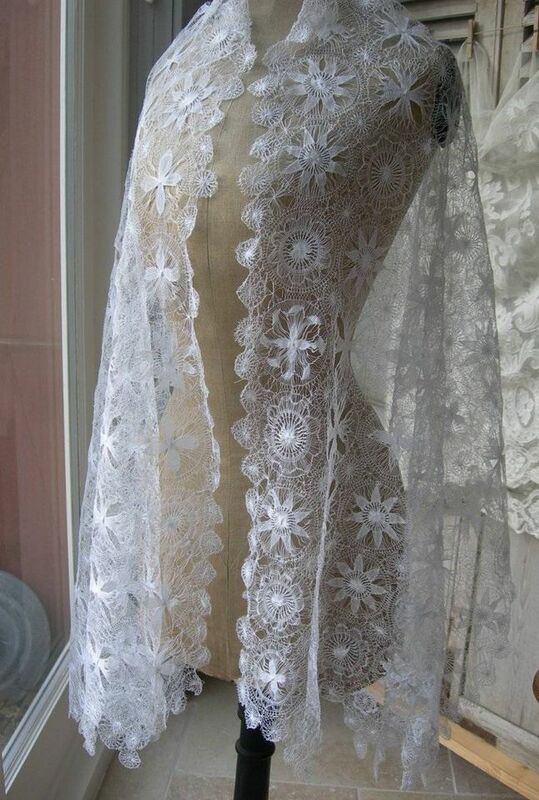 Also note the attention paid to the the lace where it meets the center cloth. Provenance: Seller purchased it in Paris. Soilage: Seller cites a pale ivory color. Small red rust marks in the lower left corner near the center cloth. Auction ends: December 11, 2016 10:38 AM PST. Comments: A lappet scarf with unusual ends, of Brussels Duchesse. No raised work in the two Point de Gaze inserts – and note the elaborate 8-petaled decorative ‘mode’ filling. The bobbinlace is densely arranged toward the ends, more open near the center. Conventional motifs, no raised work in the bobbinlace. Damage: Nothing obvious from the photos. Per seller, there might be a pinhole in the PdG mesh, photos not close enough to tell. Soilage: Seller cites a few age marks. Has a beige color from the photos. Sold for £34.00, 2 bidders. Auction ends: December 11, 2016 11:11 AM PST. 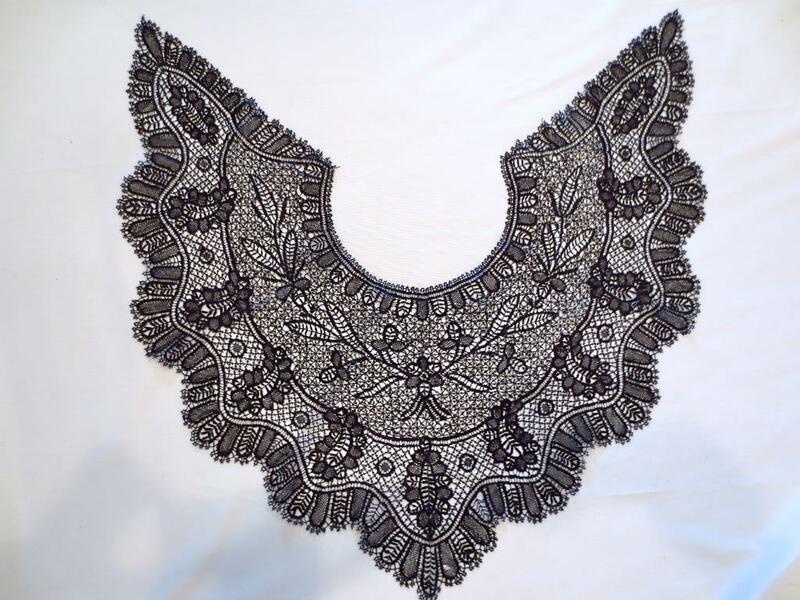 Comments: This is a handmade triangular Chantilly shawl – difficult from the photos to discern the pattern. 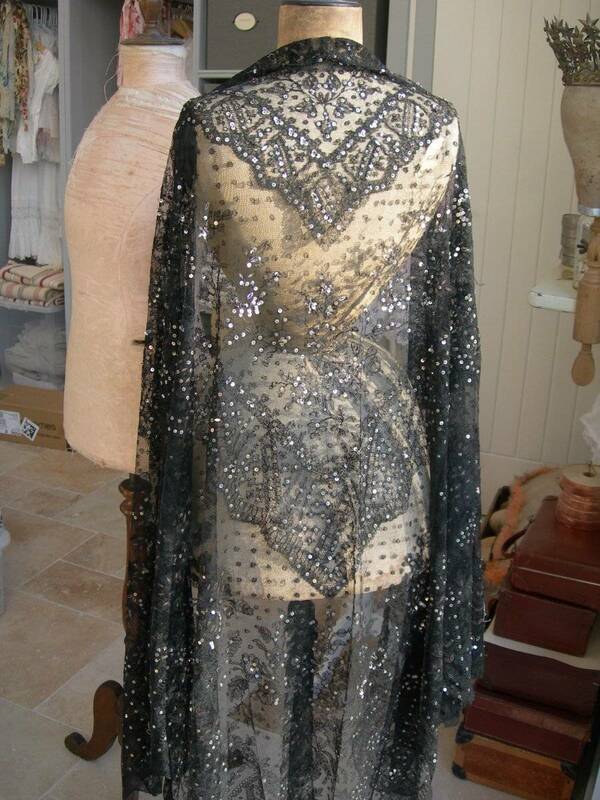 But someone went to a lot of work to embroidery all the sequins and small beads on. I’m a big fan of these shawls, but not of the embroidery. It could probably be reversed. Modifications: The sequins are not original. Damage: One small tear in the ground. Soilage: Looks clean but hard to tell with black lace. Seller says some sequins tarnished. Sold for £300.00, 2 bidders. Auction ends: December 11, 2016 1:34 PM PST. Comments: A rectangular shawl of Brussels bobbinlace applique on machine net. A middle market piece with floral design and esprits in the ground. There is some bridework fillings in larger motifs at the end. Interesting decorative ‘mode’ fillings of needlemade ring and picoted knot grids. Damage: A few pinholes in the tulle, minor. Finish: A little wrinkled, but it might just be the drape of the tulle. sold for £176.00, 4 bidders. Size: 24″ wide when open. Auction ends: December 12, 2016 11:13 AM PST. 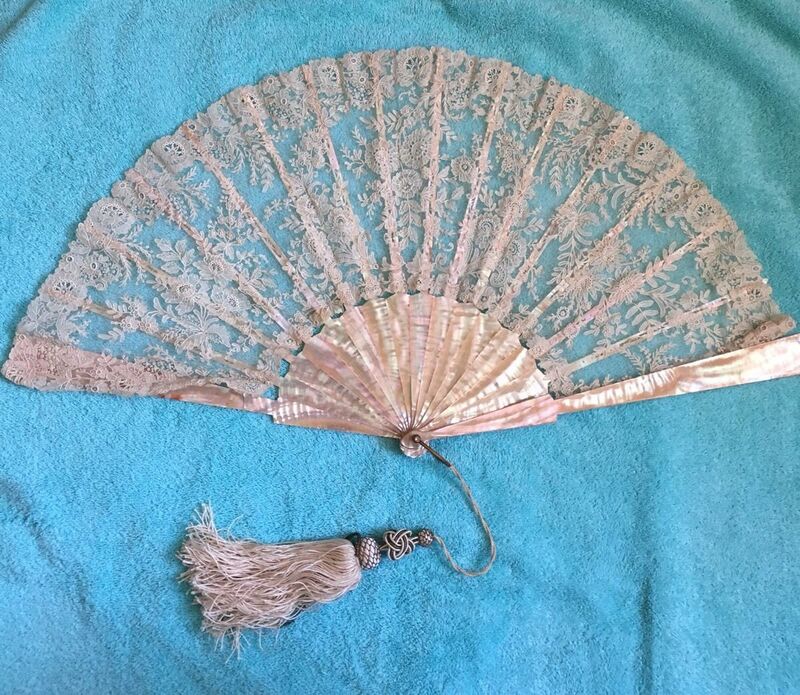 Comments: A Point de Gaze fan with Mother of Pearl sticks. 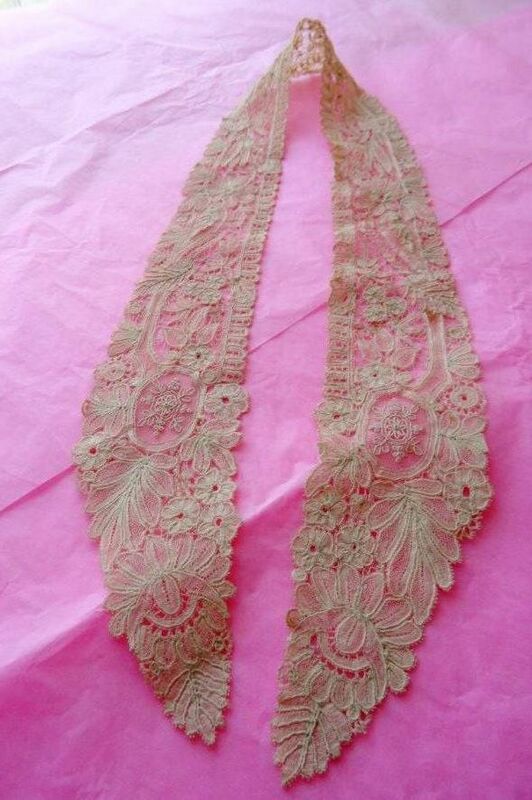 No raised work in the lace, and it has some good decorative ‘mode’ fillings. Good naturalistic design. Comes with original box tassel. Damage: Lace has come away from the sticks at one end. Two broken sticks, also some repairs to the sticks. There are signs that the lace is tied to the sticks, which helps in condition. Lace itself seems OK and PtdG ground is good from what I can see. Sold for $78.00, 10 bidders. Auction ends: December 10, 2016 7:00 PM PST. Comments: A border of Brussels bobbin and needlelace applique on machine net. The needlelace is whiter than the bobbinlace. Note the connected line of picots on the bottom edge and on some motifs – an imitation of Alençon horsehair. Raised rings and some grids of rings in various forms used as fillings in the needlelace. The bobbinlace is quite delicate with small motifs in vine patterns. The needlelace design at the bottom is a little different from the rest of the design. Modifications: Cut one end, can’t see the other end. Engrelure added. Soilage: Seller cites ivory/light ecru color. The piece has been washed and seller says it is ‘clean’. Size: 2″ wide with 3″ wide lappet bottom (not entirely sure what that means). Auction ends: December 12, 2016 9:44 PM PST. 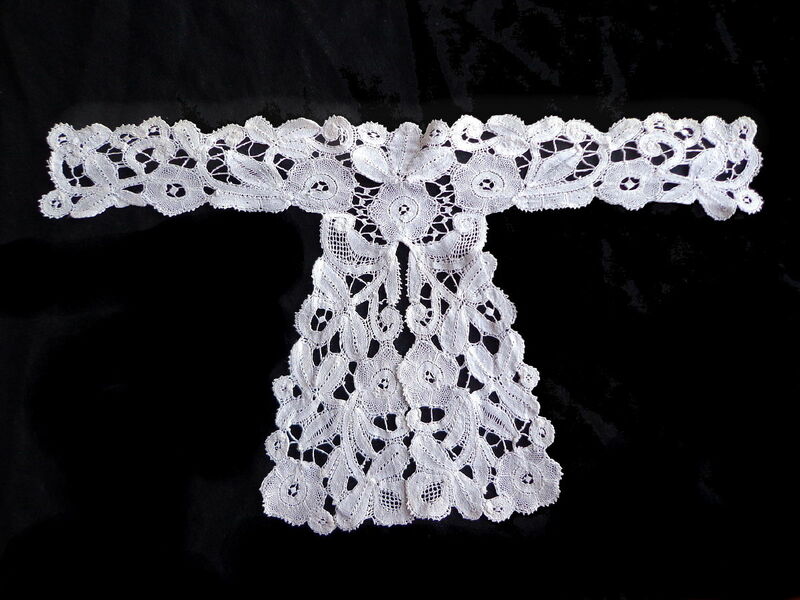 Comments: A jabot with attached neckband of Bruges Bloemwerk. Very typical leaf and rose motifs with woven square fillings, and a little meshwork filling. Nice bold design, unusual piece. Provenance: Seller says it is ‘from Scotland’. Size: 23.5″ x 15″. Lace ~2″ deep. Auction ends: December 13, 2016 9:08 AM PST. Comments: A mat surrounded by an interesting Lille or Beveran border. Hard to tell but it might have been made to fit the piece. 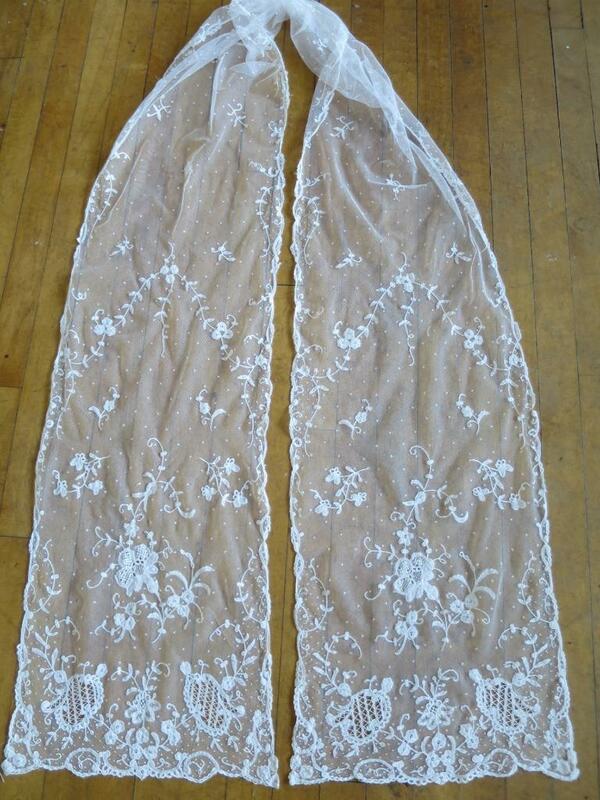 Very unusual to see this type of lace used on linens. Auction ends: December 13, 2016 11:14 AM PST. Comments: A shawl collar of black silk guipure. I’ll say it is Le Puy given the elaborate ground around the neckline and the use of halfstitch in fillings. 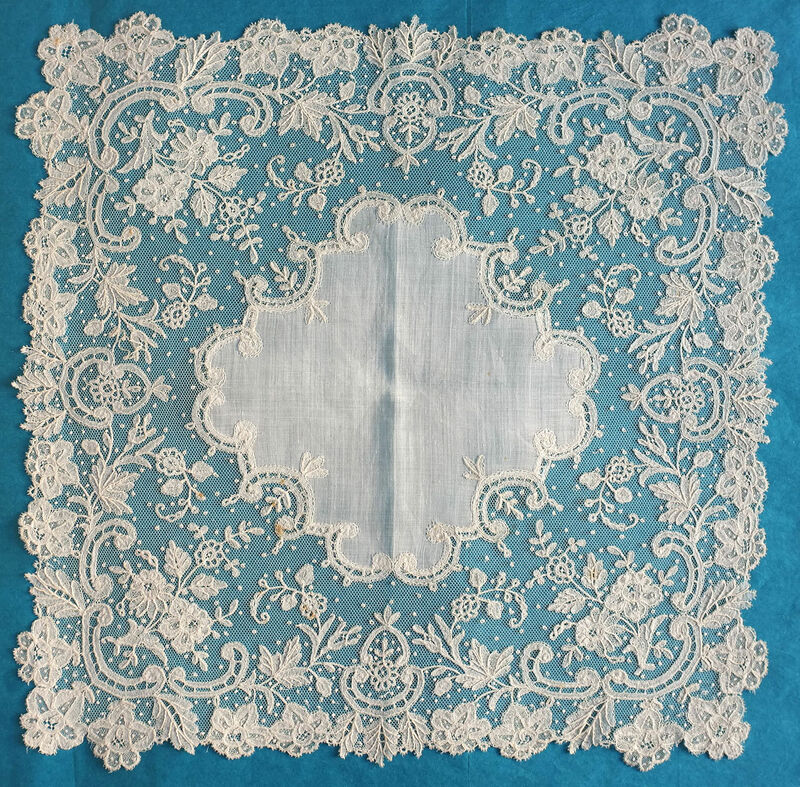 The long narrow woven leaves and halfstitch scalloped edging are also found in other Le Puy examples. Auction ends: December 17, 2016 9:43 AM PST. Comments: A rectangular shawl of bobbinlace applique on machine net. I think it’s Belgian, maybe from the Bruges area. Mainly because of the fairly simple motifs (although very nicely arranged), and the bar ground fillings. 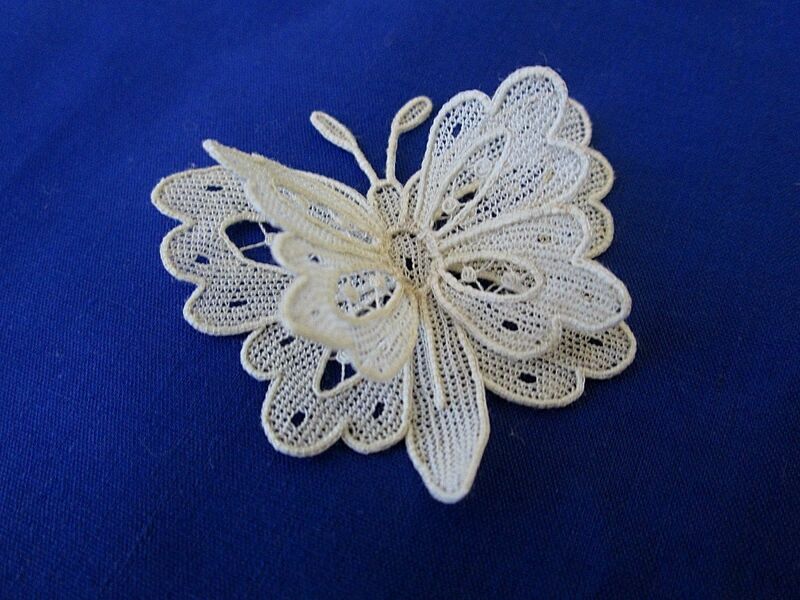 This would be an unusual piece for a Bloemwerk type of lace. Modifications: It is seamed across the middle. Auction ends: December 17, 2016 2:10 PM PST. Comments: An interesting Point de Gaze butterfly. These are basically mid 20th century tourist items. The clothwork is very solid, and there are minimal decorative ‘mode’ fillings. Very crisp, nicely made, but not as elaborate as other examples.